Nearly a decade after his service in the Civil War, Francis Hakey is drawn into a world of darkness he can scarcely imagine unfolding in the peaceful landscape of northwestern Vermont. Still troubled by his memories of the war, he confronts a far greater evil as he investigates the murder of Marie Ball, a young teacher who is stalked and slain in the late winter of 1874. Hakey’s antagonist, Joseph LaPage (the namesake of the historical serial killer) is preternatural in his cunning. Initially revealed in the first-person through a chilling blend of Christianity, animist religion and madness, he is, in some sense – ‘a force of nature’. As the long ordeal of the manhunt ensues, Hakey is joined by his old friend Ephraim Perley, Marie’s twin brother Alden and Moses Chestnut, a freedman who has crossed paths with the killer. During their journey Hakey and his men encounter colorful characters including the dauntless and fiery Marguerite LaFluer who runs an isolated logging camp. When the pursuit enters the wilderness of the Gibou, Hakey learns more of the grave danger and malevolence that must be overcome. Throughout the narrative themes of the natural and supernatural intertwine via the motifs of the harsh yet beautiful landscape, the creatures that inhabit it and cultural references to a far earlier time. The story is not however an unending tour through the dark side of human experience. Hakey’s family and community are the rock on which he stands and their contributions round the edges of what might otherwise be a jagged tale. 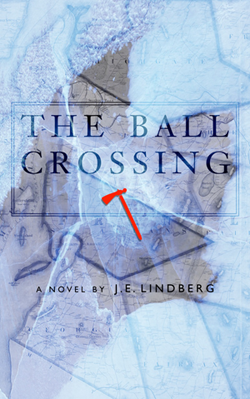 The Ball Crossing, was inspired by my childhood encounter with a monument commemorating an historical murder. This site, known as the Ball Crossing, today is nearly lost in the northern Vermont forest near my family home. In writing the novel, I have created a world and characters set in a place I know well.